This in from the TACNY email list for an event hosted by CNY Drones. Note that their website should read 9 November 2018 and not 2019! 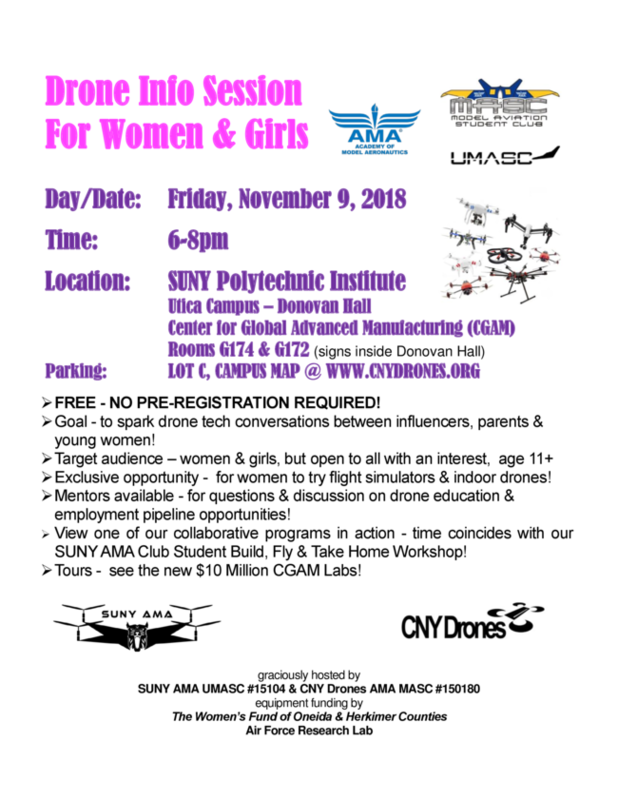 Join us for a FREE, OPEN DOOR Drone Info Session on Friday, November 9, 2019, 6-8pm in SUNY Polytechnic Institute’s Center for Global Advanced Manufacturing (CGAM) – Donovan Hall. Mentors will be highlighting the growing opportunities in drone technology for women. It’s a great time to see what we’re all about as we’re simultaneously holding a collaborative Build, Fly & Take Home workshop for SUNY Poly students with our friends, SUNY AMA UMASC! CGAM tours available! IMPORTANT! SUNY CAMPUS MAP – Parking in Lot C – use right side doors, follow the signs in Donovan Hall to the lower level, rear of bldg. Founded in 1903 as the Technology Club of Syracuse, the nonprofit Technology Alliance of Central New York’s mission is to facilitate community awareness, appreciation, and education of technology; and to collaborate with like-minded organizations across Central New York. For more information, visit tacny.org.